In 2006, Embrace sold its first policy. 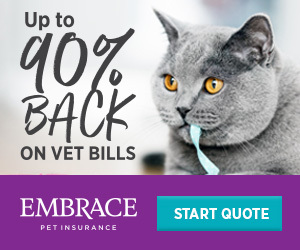 Since then, Embrace has grown to over 100,000 insured pets and paid out more than $87.4 million in claims. Embrace provides plans for insurance giants Allstate and Geico. Embrace offers an informative blog called The Water Bowl. Upper age limits Yes, no new enrollment in accident & illness coverage for pets age 15 and older. Enrollment Requirements Pets must had had an exam in the last 12 months or within first 14 days of the policy for coverage to begin. Offers the most flexible wellness options ($250, $450, or $650), no spending restrictions. Excellent customer satisfaction reviews with petinsurance review(9.3/10), and consumers advocate (8.8/10). Does not offer unlimited payout coverage, maxed out at $30,000/yr. Embrace is ideal for pet owner’s seeking high customer service, and in need of a major medical plan with a flexible wellness option. 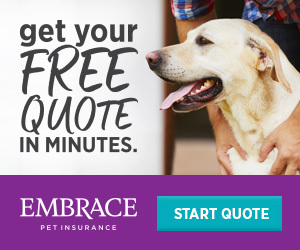 While most pet insurance wellness options have spending limits per routine procedure, Embrace is the only pet insurance which allows the pet owner to freely choose how each routine procedure should be spent. Furthermore, Embrace customer service is excellent. We called customer service at different times, and each customer service was enthusiastic and knowledgeable. However, it is important to note that while Embrace’s maximum yearly coverage is $30,000.00, and may be enough in most states, if you live in a big city or area where veterinary cost is higher than average, coverage may max out, and the remaining balance will be your responsibility. So if you are looking for a major medical plan, with $30,000 being the maximum yearly coverage, a flexible spending wellness option, and excellent service, click on Get Your Free Quote below, and see if Embrace Plans and Prices will work for you.